Oh what a night it was in the land of Swirl’n mic Mad-ness! 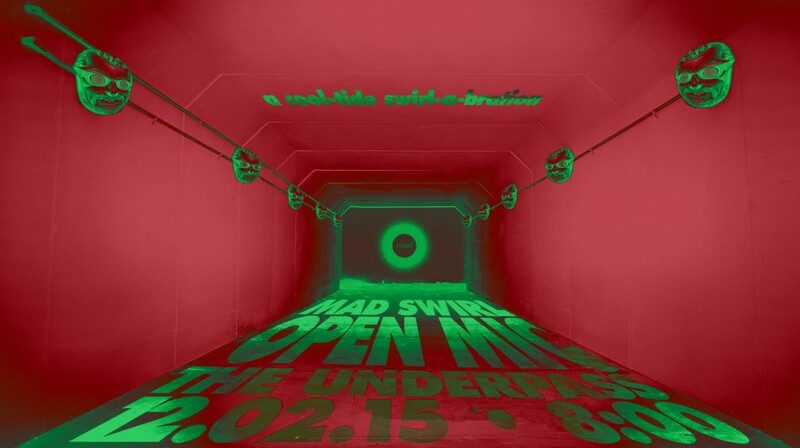 This past 1st Wednesday Mad Swirl-abrated our new open mic home at The Underpass. As much as we’re going to miss our old stomping grounds, we really dig the vibe of our new home! Our inaugural blast-off was proof that this swirl’n we be doin’ isn’t even close to stoppin’! HUGE thanks to Swirve (Chris & Tamitha Curiel, along with special guest drummer, Clark from KRUDE) for keeping the beat til the wee hours of the night. We got taken to another dimension of time and space on the wings of their jazzy madness! More HUGE thanks to fantastic photogs Dan Rodriguez (he captured these scenes) and Scott Wayne McDaniel for sharing their mad eye and giving y’all a taste of the night’s mic madness. Thanks to Mike at The Underpass for opening up his establishment to us mad ones and making us feel right at home.